When considering a new boat ladder, or shopping for a replacement for your existing boat ladder, work with the experts at New Wave Fabrication. The marine supply professionals, designers and builders at New Wave will ask you all the right questions, understand what type of boat you have, document any special requirements, and provide precisely the right ladder for your individual situation. Most boat ladders are built to standard specifications but if your boat has unique dimensions, New Wave can custom fabricate boat ladders to meet your needs. New Wave can also offer installation support so the structure of your boat is not compromised by haphazard penetrations. Ask your New Wave representative what solutions are available and order a premium boat ladder today to protect your asset and your passengers. 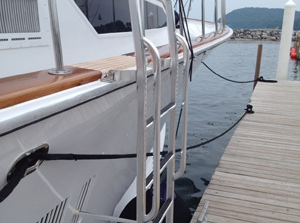 New Wave designs and builds the best yacht ladders on the market. New Wave takes your safety very seriously, as well as the health of your family, and the well-being of your passengers. With that in mind, New Wave offers superior boat ladders that are attractive, sturdy, lightweight, durable, safe, stylish, custom-fit, professionally installed, warrantied, and supremely reliable. These are not the most expensive ladders on the market but New Wave is confident they are built in the USA, using the finest materials, and built with the finest craftsmanship in the world. You cannot find a better boat ladder anywhere. Some ladders may even include custom styling, rich teak woods, aluminum or stainless steel. If you are outside of the New Wave installation service area, a New Wave representative will support the professional installation of your boat ladder over the phone or via email. New Wave won’t forget a customer as soon as the ladder ships but remains committed to that customer and stands behind all boat ladder products. New Wave intends to service its customers to the best of its ability. There is no request too strange, no variety of materials too difficult, or any requirement New Wave won’t consider. Ask your assigned customer service representative about any special shipping requests, accessories, replacement steps or hardware, special requirements, specific dimensions, or custom enhancements for your Tide Rider Ladder. New Wave can even personalize a stair by adding the name of the boat, the boat owner, or possibly the boat owner’s wife to the bottom step. Consider personalizing your boat ladder or boat step with the name of your boat or your special first mate! No matter where you are, boating should be safe, fun and satisfying for everyone on board. With sturdy, safe, reliable boat ladders from New Wave, everybody wins!